There are many different types of trailers out there. Boat trailers, campers, car haulers, utility trailers, and equipment trailers, to name a few. Most of them have one thing in common: a terrible suspension system. Many don't even have shock absorbers. Even a small curb can really jostle whatever is loaded on the trailer. When you have a rolled curb at the end of your driveway, it’s only a matter of time before something on or inside your trailer breaks. Every time you force your trailer over a rolled curb or plop it down onto the road from the driveway, the trailer and cargo take a beating. In a nutshell, trailers and rolled curbs don’t mix at all. However, there’s a solution: installing a curb ramp. 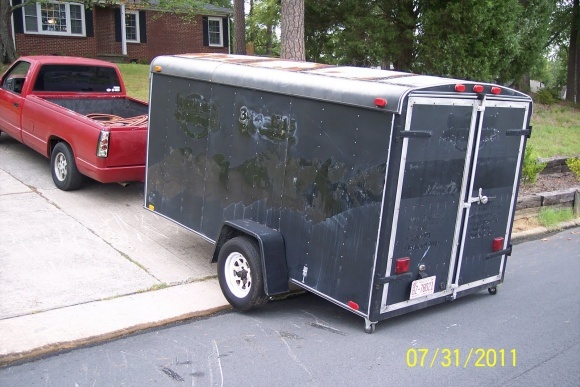 If you’re a trailer owner with a small curb at the end of your driveway, you might be able to clear it with your trailer without any issues. But proceed with caution. A curb ramp is still a great idea to make it easier. Like we mentioned above, a rolled curb can jar your trailer and it's contents. If your trailer is low to the ground, the dip at the rolled curb can cause it to drag. In other words, a rolled curb makes your trailer depreciate faster and may even break it someday. Many trailers have small wheels and tires that don't go over rolled curbs as well as car or truck tires do. Getting the trailer to go over a rolled curb often requires some momentum. Hitting the curb with even a little speed is very jarring. And backing up quickly isn't a good idea when you can't really see behind the trailer. A curb ramp smooths everything out, and makes backing over the curb a million times easier. Some people build a cold patch or hot asphalt ramp over their rolled curb. It’s a bad solution for many reasons (which are listed here) and is actually illegal in some places. These ramps are only slightly wider than a tire. If you go this route, you need to use two ramps at a time and space them apart exactly the right distance. You can't leave them in place, so you have to find a place to store them. And you need to do all this every time you use the trailer. This is an inexpensive, temporary solution for anyone clearing a curb with a trailer once or twice a year. If you take your trailer out more often than that, then you need a proper ramp. Basically, these ramps are built with scrap wood – perhaps wood blocks or a sheet of plywood – and they can be either flat or built like gradual stairs. BRIDJIT curb ramps are state-of-the-art ramps designed to solve all of the problems plaguing the other ramps on this list. These curb ramps are made from recycled rubber. They can take whatever you throw at them in terms of vehicle size/weight. BRIDJIT ramps are wider than your trailer, so backing up is easy. You can leave them out 24/7 because they’ll stay put and handle all kinds of weather. There’s even a waterway underneath them so they won’t obstruct the curb drainage system. Last but not least, BRIDJIT curb ramps are easily removable if you want to put them away for a season. BRIDJIT is a great solution for trailer owners. Learn more about the benefits of owning a BRIDJIT curb ramp here.